I am a HUGE fan of Chef Bobby Flay. When I came across his original recipe for Grilled Chicken Wings with Spicy Chipotle Sauce, I was soooooo excited. We are huge football fans at our house (yes...even our daughter! 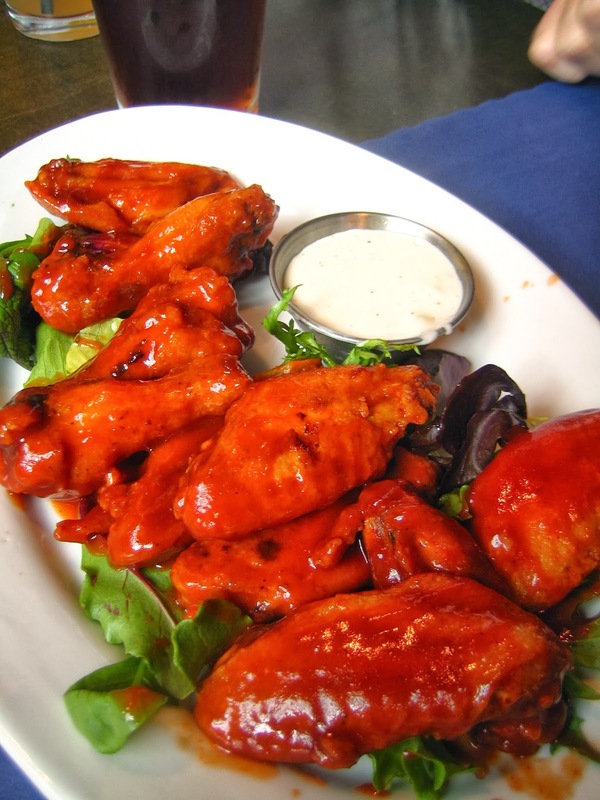 ), and nothing goes better with football than wings. The first attempt of this recipe I followed to the letter. Since then, I've made a series of tweaks to bring these wings to (in my humble opinion) a whole new level! Brining makes all the difference -- you won't believe how juicy and flavorful the meat is...only made all the better by grilling the wings (versus the traditional frying method). And the dip is just ridiculous -- definitely add these to your next Super Bowl menu and get ready for the raves. Place chicken wings in a zip-top bag. Add beer, sugar, salt, bay leaves, and red pepper flakes. Seal bag and shake carefully to combine ingredients together. Marinate for 4 hours or overnight. Combine all ingredients in a bowl and season with salt and pepper, to taste. Cover and refrigerate for at least 30 minutes before serving. Brush grill with vegetable oil, to keep wings from sticking. Remove wings from marinade and season with salt and pepper. Place on the grill in single layers and grill until golden brown on both sides and just cooked through, about 4 to 5 minutes per side. In a small saucepan, whisk together the vinegar, Dijon mustard, chipotle puree, honey, and vegetable oil. Bring to a boil over medium-high heat. Whisk in the ancho chile powder and season with salt, to taste. Continue to reduce for 5-8 minutes over medium-high heat whisking occasionally, until sauce thickens. I will warn you...your house will smell like VINEGAR! Remove from heat and add the 2 tablespoons butter, which will definitely thicken the sauce a bit more; whisk to combine, as the butter melts. If you prefer your sauce to be even thicker, continue to heat over medium-high heat until desired consistency and flavor. *Note: I reserve 2 extra tablespoons of pureed chipotle, in order to make a separate HOT batch of wings (add the extra chipotle to 1/2 cup of the reserved sauce in Step 4). What's great about chipotle is that the heat is combined with smoky flavor -- not too overpowering, yet definitely clears the sinuses. Once sauce is done, add to the grilled wings and combine. Cover until ready to serve. Remove to platter and sprinkle with 1 tablespoon chopped cilantro.